← When I’m 64. And a half. Sing your worries a song. Dance with them. Tell them a joke. Or bake them a pie. I love this idea. I mean, I totally love it. It’s the rarest of gifts: a brand new idea. At least it is for me. I didn’t make it up. I found it online, attributed to Dr. SunWolf, in the form of these words: Invite your melancholy outside for a walk. Or read it a poem. Or bake it chocolate chip cookies. Hmm. Melancholy. That’s a word you don’t see much these days. Well, there are actually times when I feel something like melancholy. Not always, thank goodness. Not even most of the time. But worried? Now you’re talking my language. Almost never is when I’m not worrying about something. Or more accurately, a lot of things. There are the ritual worries (Did I turn off the stove? ), the mama worries (Are the kids all right? ), performance worries (Am I working hard enough? ), dumb worries (Are my arms too fat? ), widespread worries (Can this plane really fly? ), phobic worries (Is that a snake? ), panic worries (Is this a heart attack? ), and achievement worries (Did I list enough worries? Did I overdo it? Am I boring them already?). You know how it is. Some of them masquerade as helpful reminders (“Are you sure you couldn’t do that better if you gave it a bit more thought? Right now?”) Others just bust their way in with sledgehammers (“Your sedentary lifestyle is going to kill you!”) And even though, after all these years, I’ve come to expect their arrival, it’s hard to loosen their grip. Often impossible. 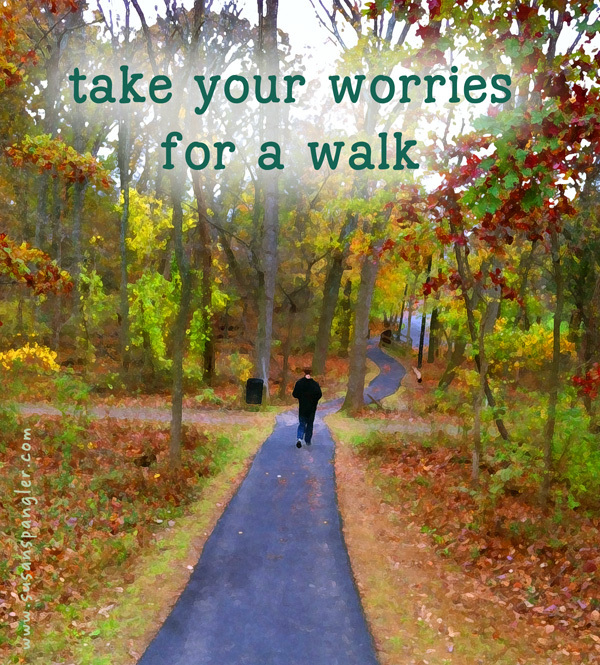 That’s why I love this idea of taking your worries for a walk. I love it so much that I want to hold it on my lap and give it a big kiss. Because: if you can take your worries for a walk, or paint them a picture, or warm them a bowl of split pea soup, that must mean that you and your worries are not one and the same. You are one thing. And your worries are another. I don’t know about you. But up until now, I have never questioned the notion that my worries and I were inseparable. Whither I goeth, here cometh my worries. Up until now, my range of responses to worries has consisted of two options: 1. Worry. 2. Try not to worry (a strategy that so rarely works, there’s really only one option, which is: worry). But now comes a new perspective: The summons to worry can be ignored. It has no basis in law. Or physics. You and your worries are separate entities. You are not knotted together into the same straight jacket. You can be pried apart. There can be a space between you. And worries. By which I’m definitely not saying, “Don’t worry.” Because, as we’ve already noted, that approach does not get the job done. Worrying is a habit. It’s a well-worn path. An old familiar. It’s the way we’ve always done things around here. What I am saying is that later on tonight, when I close my eyes and my worries crank up the volume, I think I’ll try something new. And in the meantime, I think I’ll go for a walk. This entry was posted in affirmation, boundaries, encouragement, gratitude, inspiration, kindness, peace of mind and tagged #affirmation, #boundaries, #encouragement, #gratitude, #inspiration, #kindness, #shygirl. Bookmark the permalink. 2 Responses to Take your worries for a walk. I am so very impressed and inspired by this post! You most definitely have a unique voice and I can relate to your observations so well that I might have written them myself. But you did! And you did an excellent job of it! Looking forward to seeing more . . . Peace. Thanks so much! That’s exactly what I hope for – that these posts will strike a chord with the people who read them. Like the sparks that ignite in conversations with good friends. Thanks for taking the time to write – hope to hear from you again!